Well my forum update is finally Completed. I put this off for a long time. Until I had the amount of time to dedicate to it. So I had to put this off until the storm cleared. I spent this week, Changing things, Removing and adding new Mods. And I wanted to personally thank you guys for the help on some of the Code changes. So I'm calling this project DONE ! Maybe even MG will think of replacing these in the default black pearl packs ?????? Hey St0ney it's very nice, I love your customizations. I don't like capital letters in website addresses and you really should avoid using caps... I'm referring to /Forum/. Remember that internet addresses are case sensitive on Linux. I like the header even if it has the border, maybe can be improved by removing it, but I'm not really sure, it is something you should test. I don't like the bottom border as is... I know it's like I designed... but with your new background I think it should be different... I still don't know how, but different. I would invert the icons... dark when no messages, and bright yellow when there are new messages. LMAO! 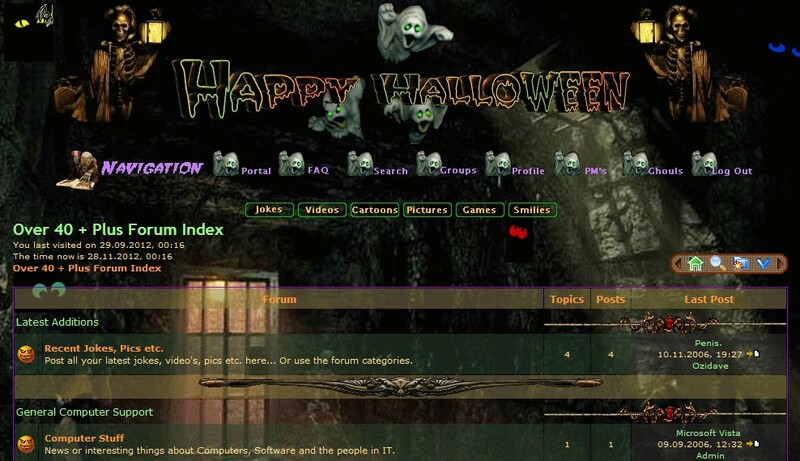 I made a Halloween theme some years ago with a real spooky background of Ghouls, skeletons, eyes glowing in the dark and all of it in an old dungeon. I'm not sure but I'll see if I still have it somewhere on an old cd backup, as you might be interested in it. And I'm sure I've seen some pumpkin smilies somewhere - Not even sure if I don't have them on a cd or dvd somewhere? That was the only thing I think made it look slightly unfinished. Thanks Guys for the Feedback and Suggested Changes. Joshua203: Thanks for the Images, But to be honest, My forum will always be Dark Black or Dark Gray. It's an extension of my pumpkin carving Pattern business. And the Mocks that I post really POP with the dark back ground. MG: Your Right and thanks So much for the Feedback. And also other sections of my Main Site (i.e /Patterns). 2) I think this is personal taste (I also like it with the boarder) It makes it look like it's part of the overall Style/Forum. Didn't want to look like it's just sitting above the rest of the layout. 3) Bottom Boarder - Yeah I see what you mean, I'll look into that as a change. 4) Table on bottom I fixed that last night, I do like the info for the past 24 hours. It BROKE the bottom of the Style. 5) I switched the Icons - Yep makes a lot more sense now (Read/Unread) -- Thanks for that. So the Pumpkin Glows now with un-read messages. 6) on the Validation - I will clean up what I can, But it looks like most of the error codes are from installed Mods. And I'm not Comfy screwing around with that code. And the report is showing like one bad symbol in a code string. Some of the errors shown are also questionable. yeah that would really be Helpful - My Entire Site is based on Halloween/pumpkin carving. Always Fun dealing with my web host to go from VPS to super fast Dedicated Just for October. Also thanks for the animated Gif Below - Already saved and will add either on the Forum on Main Site. I found this - Over 6 years ago - and had to modify the sql to install the damn thing, and even then, I didn't expect it to work. But I had forgotten that I had made the whole thing transparent. Anyway you can have the lot if you want it. This actually has a transparent background. 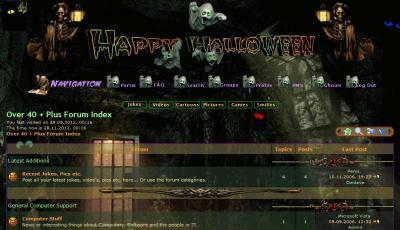 I´m thinking of giving my forum a complete overhaul. I'm not quite sure what you mean Spydie. I never looked at any errors/warnings as MG is suggesting but here are some no-no's for a start. Use <br /> There is a reason for self-closing tags. and for lowercase. But I'm not here to criticise - it still works - but some browsers may play merry hell with the mistakes that are there ?